Flown the Orion spacecraft farther into space than any spacecraft built for human passengers has flown in more than four decades. Moved the Space Launch System rocket from concept to development, hitting critical benchmarks. Moved forward on the Asteroid Redirect Mission, which will test new capabilities – like advanced propulsion systems – that will be needed for future human expeditions to Mars. Sent the MAVEN spacecraft to Mars to join a fleet of orbiters and surface rovers, building on America’s 40-year legacy of advanced robotic exploration of that planet. Sent astronaut Scott Kelly to the International Space Station to spend a year there to continue research into how the human body responds to extended periods of time off the planet. Chose Boeing and SpaceX to transport our astronaut crews to the station, bringing those launches back to America in 2017 and ending our sole reliance on the Russians to get humans into space. Tested new technologies like Low Density Supersonic Decelerator that will allow heavier spacecraft to land safely on places like Mars. On April 15, 2010, President Obama visited the Kennedy Space Center in Florida to lay out his vision for the future of NASA and for maintaining U.S. leadership in human spaceflight. 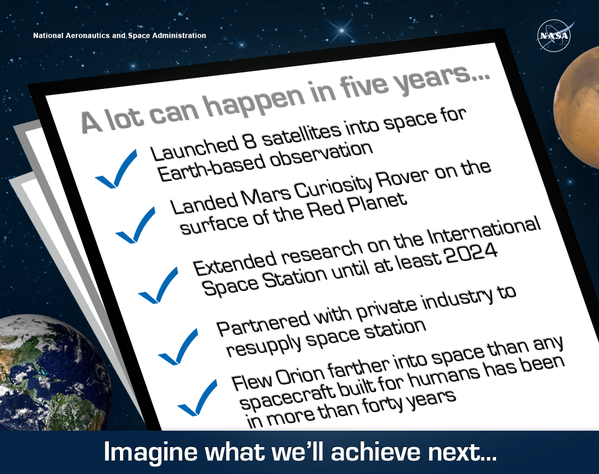 Five years later, America’s space agency has made incredible progress toward the goals the President outlined in that speech. Two commercial companies have made ten trips to the International Space Station. These American companies, launching from American soil, have transported vital cargo and ground- breaking scientific experiments to the crew that live and work on the orbiting laboratory. Two American companies have also been selected to bring astronauts to the International Space Station. They will return human spaceflight launches to American soil in 2017. In 2014, the Orion spacecraft had a nearly flawless test flight, traveling farther into space than any spacecraft built for humans had traveled in more than forty years. NASA and the Administration have made an unprecedented investment in technology development, working on groundbreaking advances that will support future missions in science and exploration and grow the space economy. NASA has also taken impressive steps on its human Journey to Mars. Back at home, the space agency has launched 8 new Earth-observing satellites to help improve our understanding of our changing climate. • International Space Station. NASA’s path for the human exploration of Mars begins in low Earth orbit aboard the International Space Station. Astronauts on the orbiting laboratory are helping us prove many of the technologies and communications systems needed for human missions to deep space, including Mars. The space station also advances our understanding of how the body changes in space and how to protect astronaut health. o Year in Space. On March 30, 2015, astronaut Scott Kelly began his one-year mission in space. His time on the International Space Station will help us gain new, detailed insights on the ways long-duration spaceflight affects the human body. Medical data from Scott will be compared to data from his twin brother Mark on the ground. This research will compare data from the genetically identical Kelly brothers to identify any subtle changes caused by spaceflight. o Extension to 2024. In 2014, the Obama Administration approved an extension of the International Space Station until at least 2024. The extension is critical to completing necessary research to support long-duration missions beyond low Earth orbit. • Orion. As the President delivered his remarks in April 2010, he stood in front of a mockup of the Orion crew capsule. On December 5, 2014, Orion launched atop a Delta IV Heavy rocket from Cape Canaveral Air Force Station in Florida and completed a nearly flawless test flight that took it farther into space than any spacecraft built for humans had traveled in more than 40 years. The four-hour flight tested many of the systems most critical to safety, including launch systems, avionics, parachutes, and the heat shield. As the President said in his 2015 State of the Union Address, we’re “pushing out into the solar system not just to visit, but to stay.” Orion is a vital part of that goal, “part of a reenergized space program that will send American astronauts to Mars.” Orion will launch atop the world’s most powerful rocket ever built, the Space Launch System. The uncrewed Orion will travel into a lunar Distant Retrograde Orbit, breaking the distance record reached by the most remote Apollo spacecraft by 30,000 miles (275,000 total miles). The mission will last 22 days and will test system readiness for future crewed operations. • Asteroid Redirect Mission. In March of 2015, NASA announced more details in its plan for its Asteroid Redirect Mission (ARM), which in the mid-2020s will test a number of new capabilities needed for future human expeditions to deep space, including to Mars. A robotic spacecraft will capture a large boulder from the surface of a near-Earth asteroid and move it into a stable orbit around the moon for exploration by astronauts. In his 2010 address, the President challenged NASA to develop breakthrough propulsion systems and other advanced technologies. The ARM mission is critical to meeting that challenge. The ARM robotic spacecraft will test a number of capabilities needed for future human missions, including advanced Solar Electric Propulsion (SEP), a valuable capability that converts sunlight to electrical power through solar arrays and then uses the resulting power to propel charged atoms to move a spacecraft. In April 2010, President Obama said, “in order to reach the space station, we will work with a growing array of private companies competing to make getting to space easier and more affordable... we will also accelerate the pace of innovations as companies -- from young startups to established leaders -- compete to design and build and launch new means of carrying people and materials out of our atmosphere.” We have made incredible progress on this promise over the last five years. Along the way, the commercial cargo and crew programs played a central role in helping the U.S. launch industry to regain its international competitiveness in the commercial space launch market. toured the SpaceX launch pad and saw the Falcon 9 rocket. A few months later, that rocket had its first test flight. Then in May 2012, SpaceX became the first commercial spacecraft to dock with the International Space Station. Since then, SpaceX has made six trips to the orbiting laboratory, delivering cargo and experiments to the crew onboard. SpaceX is contracted to complete at least [six] more cargo missions. Orbital successfully completed a demonstration mission. It subsequently sent its Cygnus spacecraft on two cargo resupply missions to the ISS. The 2014 mishap with its third resupply launch was unfortunate, but NASA remains confident that Orbital can carry out the remaining [three] launches in its contract. Orbital’s next trip to the space station is set for later this year. • Commercial Crew. In September 2014, NASA announced that it had selected two commercial companies to carry astronauts to the International Space Station. This selection ensures that U.S. astronauts will once again travel to and from the orbiting laboratory from U.S. soil. NASA selected Boeing and SpaceX to transport crews using their CST-100 and Crew Dragon spacecraft, respectively, with a goal of ending the nation’s sole reliance on Russia in 2017. Since then, both companies have met milestones on their path toward launch crews. Boeing, for example, has broken ground on its crew access tower. to step by step push the boundaries not only of where we can go but what we can do in space. 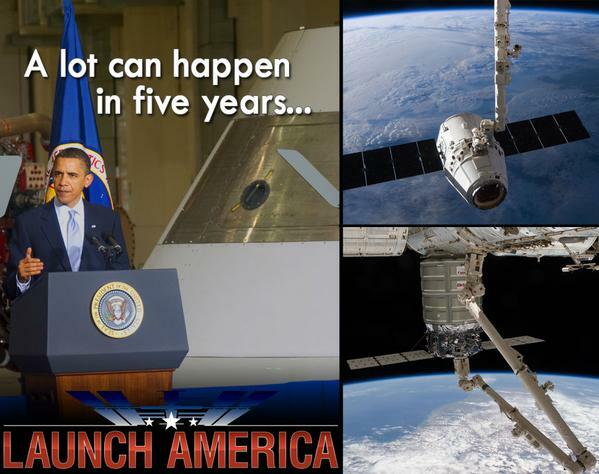 In the five years since, NASA has done just that. Technology drives exploration and is key to expanding the space economy. • Establishment of the Space Technology Mission Directorate. In 2013, NASA established the Space Technology Mission Directorate (STMD). STMD is developing the crosscutting, pioneering, new technologies and capabilities needed by the agency to achieve its current and future missions. STMD matures the technology required for NASA’s future missions in science and exploration while proving the capabilities and lowering the cost for other government agencies and commercial space activities. o Mars Entry Decent and Landing. NASA seeks to use atmospheric drag as a solution for landing ever-larger payloads on Mars, saving rocket engines and fuel for final maneuvers and landing procedures. The heavier planetary landers of tomorrow will require much larger drag devices than any now in use to slow them down -- and those next-generation drag devices will need to be deployed at higher supersonic speeds to safely land vehicle, crew and cargo. NASA's Low- Density Supersonic Decelerator Technology Demonstration Mission successfully tested this new, advanced space technology during its maiden flight last summer. The directorate will fly again this summer a full-scale, stratospheric test of these breakthrough technologies high above Earth to prove their value for future missions to Mars. resources, American companies are lowering the cost of launching cargo into space. As lower launch costs transform economic decision-making, new markets for services that once were cost-prohibitive are becoming increasingly realistic. • Advanced Manufacturing. NASA has been a major supporter and contributor to the President’s efforts to strengthen advanced manufacturing in America. For example, NASA is expanding its efforts to engage industry and academia on advanced manufacturing topics central to the nation’s space mission through its National Center of Advanced Manufacturing, with a particular focus on manufacturing technologies that reduce the weight of materials during space flight. o 3-D Printing. NASA is exploring the use of many types of 3-D printing (also called additive manufacturing) that can benefit every phase of NASA missions from launch to science payload development to robotic exploration to deep space missions. In 2014, a 3-D printer was tested on the International Space Station and 21 items were manufactured. o Advanced Composites. NASA’s Advanced Composites Project is a public- private partnership that is geared toward reducing product development and certification timelines by 30 percent for composites infused into aeronautics applications. Use of composite materials leads to lighter, more fuel-efficient aircraft. • Expandable Space Habitat Technology. In 2013, NASA announced that it would test expandable space habitat technology on the International Space Station. The demonstration of expandable space habitat technology supports NASA’s long-term exploration goals on its journey to Mars, for which the agency will need to develop a deep space habitat for human missions beyond Earth orbit. The Bigelow Expandable Activity Module, built by Bigelow Aerospace, has been delivered to NASA, and is ready to launch to the International Space Station later this year. Observatory (DSCOVR). DSCOVR is on its way to an orbit one million miles from Earth, giving NOAA's Space Weather Prediction Center forecasters more reliable measurements of solar wind conditions, improving their ability to monitor potentially harmful solar activity. o Solar Probe Plus. Solar Probe Plus will come closer to the Sun than any spacecraft has ever flown. In 2015, the mission successfully completed its critical design review, which certified that the Solar Probe Plus mission design is appropriately mature to continue with the final design and fabrication phase. November 2011 and landed safely on the red planet in August 2012. Since its arrival, Curiosity has made several important discoveries, including finding that ancient Mars could have supported microbial life. o MAVEN. The Mars Atmosphere and Volatile EvolutioN (MAVEN) spacecraft launched in 2013 and arrived in Mars’ orbit in September 2014. It has since completed 1,000 orbits around the red planet and observed two unexpected phenomena in the Martian atmosphere: an unexplained high-altitude dust cloud and aurora that reaches deep into the Martian atmosphere. o InSight. NASA is working hard on the InSight lander, which is scheduled to launch in 2016. InSight will study the planet’s core to understand the evolutionary formation of rocky planets, including Earth. o ExoMars. NASA will provide several components for the European Space Agency’s ExoMars program. NASA is providing communications equipment for the ExoMars Orbiter, which is set to launch in 2016. The orbiter will be followed by a rover in 2018. NASA will provide a mass spectrometer and electric components for the rover’s astrobiology instrument, which will study organic molecules on Mars. o Mars 2020 Rover. In 2012, NASA announced plans for a new Mars rover, set to launch in 2020. Mars 2020 will address key questions about the potential for life on Mars and provide opportunities to gather knowledge and demonstrate technologies that address the challenges of future human expeditions to Mars. • James Webb Space Telescope. For 25 years, NASA’s Hubble Space has been capturing stunning images and making many discoveries. The James Webb Space Telescope is an orbiting infrared observatory that will complement and extend the discoveries of Hubble. Webb will be able to look much closer to the beginning of time and to hunt for the unobserved formation of the first galaxies, as well as to look inside dust clouds where stars and planetary systems are forming today. Over the last five years, key components of Webb have been assembled and undergone rigorous testing. Our planet is changing. Through the gradual build-up of more greenhouse gases in the atmosphere, Earth is warming. As Earth warms, ocean waters expand and ice melts to make sea levels rise. The cycle of rainfall and evaporation accelerates, leading to more severe droughts and more severe bouts of rainfall. Heat waves become more frequent and more intense. It is this changing world that NASA continues to explore and strives to understand, so that societies can meet the challenges of the future. At the Kennedy Space Center in 2010, President Obama said, “We will increase Earth-based observation to improve our understanding of our climate and our world -- science that will garner tangible benefits, helping us to protect our environment for future generations.” Since then, NASA has launched eight Earth-observing missions, bringing the total number of Earth-observing satellites to twenty. These missions, along with ground- based and airborne campaigns increase our understanding of our home planet, improve lives, and safeguard our future. • Drought Monitoring. NASA missions like the Soil Moisture Active Passive (SMAP) satellite and the Global Precipitation Measurement (GPM) Core Observatory are providing crucial information about the extent of drought in the United States and around the world. The data from these missions not only helps scientists understand our changing planet, but can also be used by farmers to plan their growing seasons and by local leaders to make decisions about water use. • Sea Ice Observation. Every year, NASA scientists collect data from satellite, airborne, and land missions about changes in sea ice on Earth. Their research has shown that global sea ice is diminishing. As a whole, the planet has been shedding sea ice at an average annual rate of 13,500 square miles (35,000 square kilometers) since 1979, the equivalent of losing an area of sea ice larger than the state of Maryland every year. • Extreme weather events. NASA’s Earth-observing missions allow us to monitor activity across the planet. This includes extreme weather events like hurricanes, tornados, and floods. This monitoring increases our understanding of Earths’ water and energy cycle, improves climate modeling and prediction, and improves weather forecasting. • Climate Data Initiative. In 2013, as part of the President’s Climate Action Plan, the White House tapped NASA, along with NOAA, to lead the Climate Data Initiative, a broad effort to leverage the Federal Government’s extensive, freely-available climate- relevant data resources like NASA missions to stimulate innovation and private-sector entrepreneurship in support of national climate-change preparedness. • Sustained Land Imaging. In 2013 NASA launched Landsat 8, continuing a 42-year record of moderate-resolution measurements of Earth’s landmasses. The President’s FY 2016 Budget sets out a multi-decade plan for continuing this important data, which is used for a variety of purposes ranging from crop monitoring to water management in the Western States. company to lease Launch Complex 39A. The launch pad, which was originally designed to support the Apollo Program and later modified to support the Space Shuttle Program, is now under construction and will eventually serve as a platform for SpaceX to support their commercial launch activities. o Vehicle Assembly Building. NASA’s Ground Systems Development and Operations program and support contractors are upgrading the massive Vehicle Assembly Building for the next chapter in human exploration. Modifications are being made so that the building can house the Space Launch System, the largest launch rocket ever built. SLS will send astronauts aboard the Orion spacecraft to explore deep space destinations. o Orbiter Processing Facility-3 In an innovative agreement signed in 2011, NASA announced a partnership with Space Florida to occupy, use, and modify Kennedy Space Center's Orbiter Processing Facility-3. Space Florida, the aerospace economic development agency of the state of Florida, signed an agreement with Boeing allowing the company to use the former shuttle facility to manufacture and assemble its CST-100 spacecraft. The CST-100 will be used to carry astronauts to the International Space Station. Private companies. More than 150 aerospace providers in 37 states are working to get American astronauts back into space on American spacecraft and rockets.